Gabon’s closest election since independence has erupted into controversy and violence. 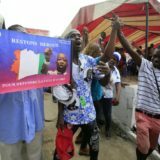 President Ali Bongo, who succeeded his father’s 42-year rule in 2009, claims the narrowest of victories over challenger Jean Ping. 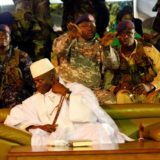 Ping is former chairman of the African Union and son-in-law of the former president. 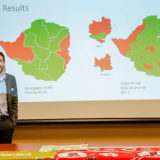 This close and contested result has been released in a context where Gabon’s electoral commission has continually failed to meet the public’s demands for transparency and confidence in managing free and fair elections. 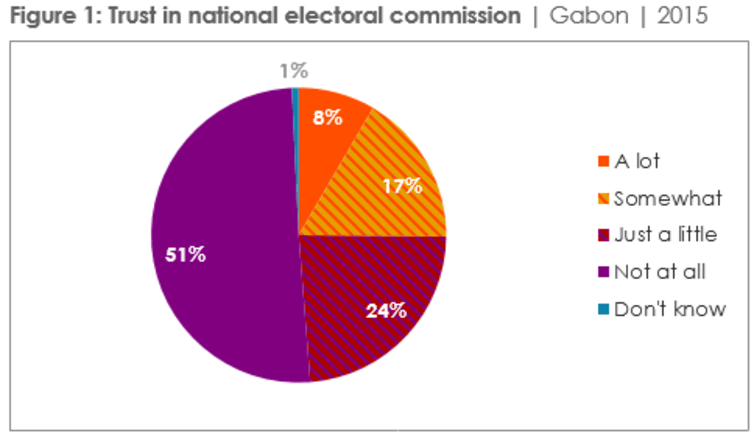 Data from the Afrobarometer survey conducted in September and October of 2015 reveal that a majority (51%) of Gabonese had no trust “at all” in the election commission. Another 24% reported “a little bit” of trust (see Figure 1). These are the lowest trust ratings of any election commission among the 36 African countries surveyed by Afrobarometer. Gabon enjoys a per capita income four times that of most sub-Saharan African nations. But because it has high levels of income inequality, a large proportion of the population remains poor. Oil accounts for approximately 80% of its exports. Not only do Gabonese mistrust the electoral commission, they also do not feel elections are free and fair. When asked to judge Gabon’s last election (in 2011 for the National Assembly), a majority (55%) found the elections to be seriously flawed. One-third of citizens (31%) reported that the elections were “not free and fair”. Another 24% found them “free and fair but with major problems”. 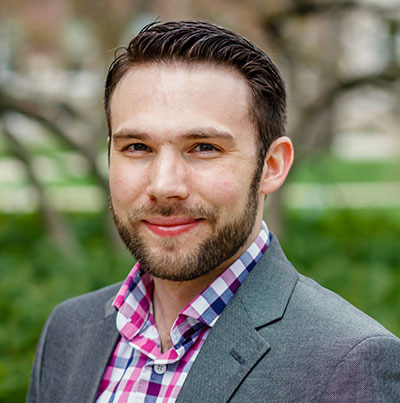 The most intense discontent with election quality was recorded among urban residents. A majority (58%) said they were not free and fair or had major problems. This is compared to 45% in rural areas. Gabonese also expressed major concerns about the environment leading up to elections (see Figure 2). Significant proportions (56%) believe that the government interferes with the political opposition by at least “sometimes” preventing opposition candidates from running. Three-fourths (77%) said the news media “never” or only “sometimes” provides fair coverage of all candidates. That is the worst rating among the 36 surveyed countries. And 71% perceived that voters are “often” or “always” bribed, well above the 36-country average of 43%. In the 2015 survey, Gabonese also reported high levels of fear of intimidation or violence during election campaigns. Nearly two out of three (64%) expressed at least “a little bit” of fear, including almost one-fourth (23%) who expressed “a lot” of fear. With protests and government response turning violent, the fears of many have become reality. 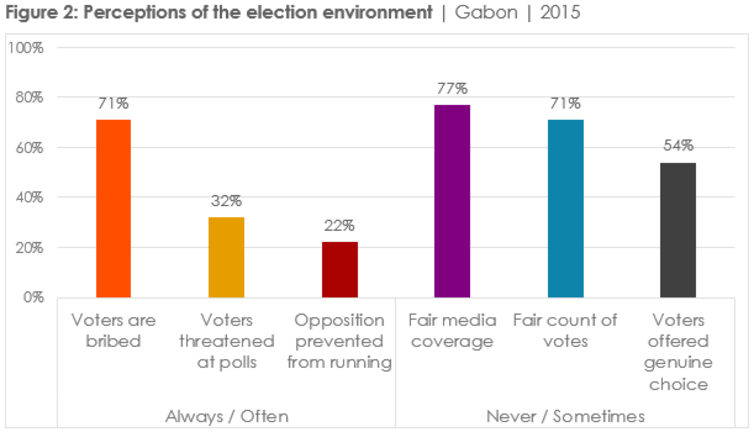 Gabon has one of the lowest proportions among surveyed countries (only 45%) who believe that voters are “often” or “always” given a genuine choice in voting. 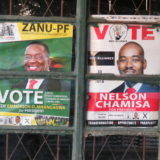 Few citizens believe that elections function “well” or “very well” to ensure that voters’ views are reflected (23%) and that voters can remove poorly performing leaders from office (19%). 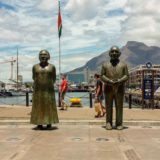 Both of these figures are the lowest among the 36 surveyed countries. 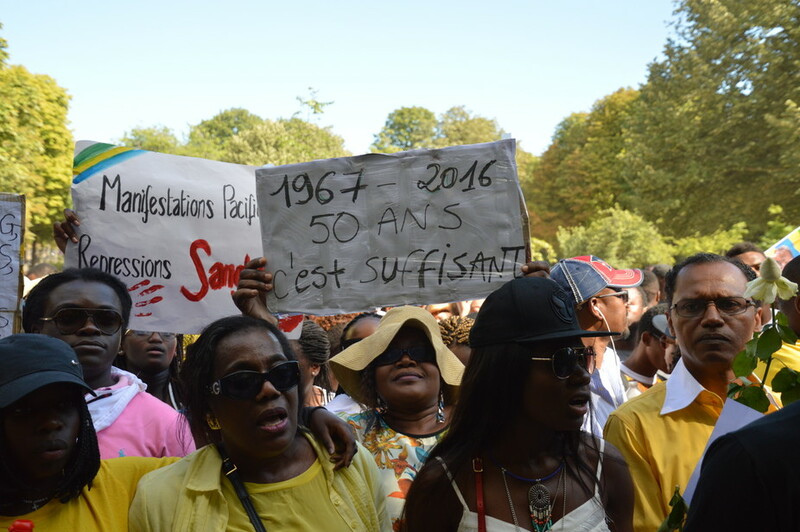 Yet despite their extreme levels of discontent with the current implementation of elections, Gabonese still have faith in the ideals of democracy and rule through elections. Two-thirds (68%) of Gabonese citizens say democracy is preferable to any other political system. This matches average support for democracy across the surveyed countries. Large majorities reject forms of autocracy (one-party, one-man and military rule). And three-fourths (76%) of Gabonese say that regular, open and honest elections are the best way to choose leaders. 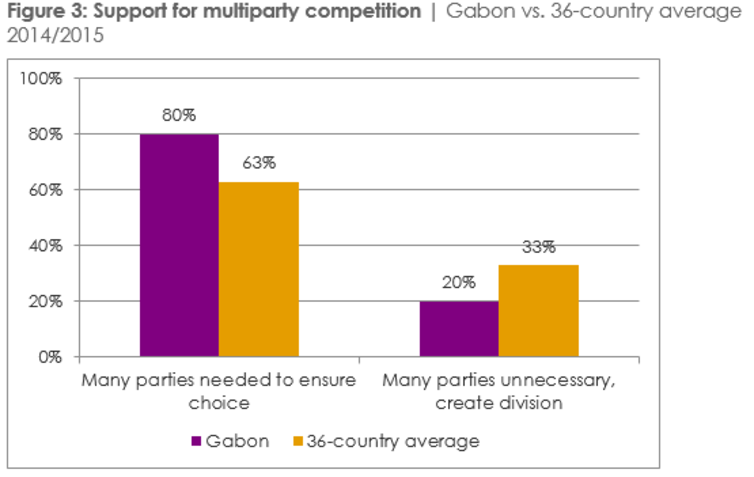 In their support for multiparty competition (80%), Gabonese are second only to Ivoirians (82%) and far above average (63%) (Figure 3). 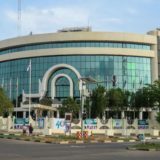 The Afrobarometer results underscore the longstanding concerns of ordinary Gabonese about the extent to which the country’s elections are free, fair and an honest reflection of the will of the people. Unfortunately, neither the government nor regional or international attention addressed these concerns in time to prevent bloodshed. The gap between the reality of Gabon’s elections and its democratic ideals appears to be widening.